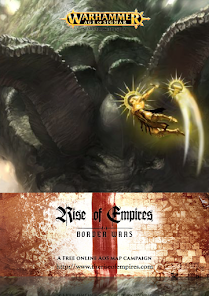 This is a new series of Blog posts I will be doing which will go into details of war scrolls, stats, synergies and experience I have had playing with or against. Hopefully it will help me find more depth in the units as well as tactics that can be employed with them. 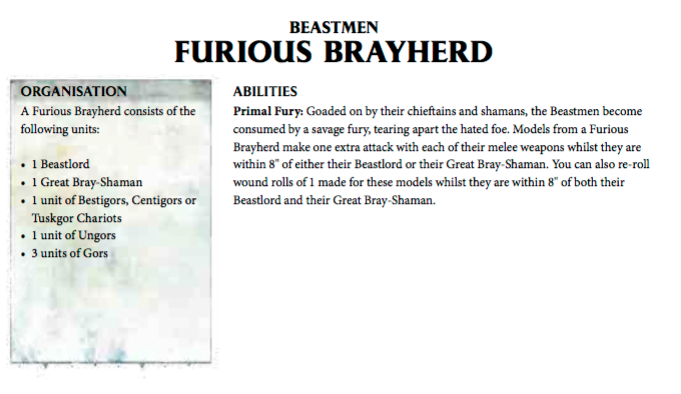 This first review will focus on the brayherd units in the Beastmen war scrolls. 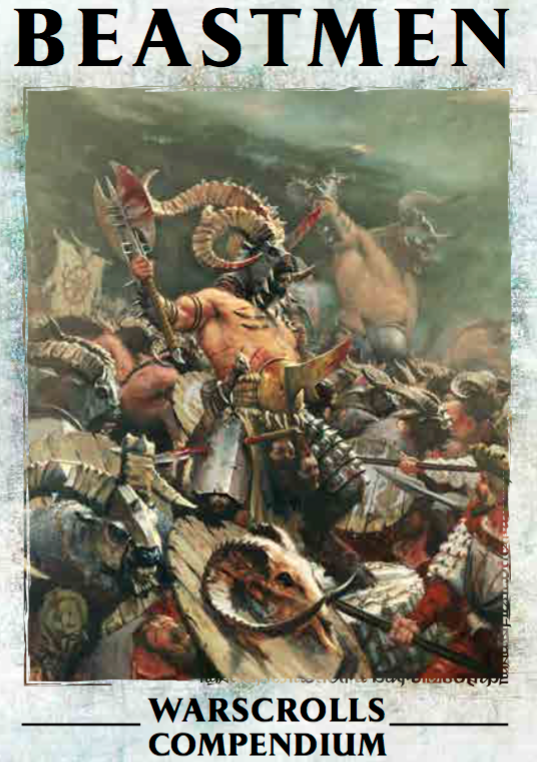 There is so much synergy with Beastmen and if used correctly, they become a super fast, hard hitting mass of flesh and horns. 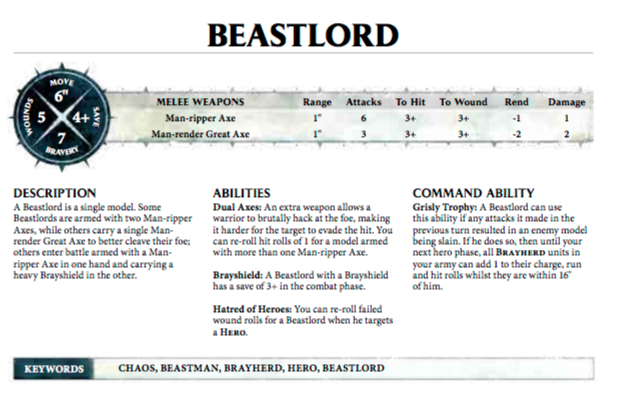 So a good place to start is the Beastlord, who can be armed with two axes, one great axe or an axe and shield. This will depend entirely on the type of army you want to produce. Two axes is a good idea for a fast army, a great axe is good for a slower advance and shield for defence (which Beastmen are not built for). I use two axes as you need your Beastlord killing things early on, the re rolling 1's on the hit rolls helps, to get his bonuses. To use his command ability you will have needed to of killed something in the previous turn, this proves a problem but can be overcome. You will need the second turn. Let your opponent come closer on their turn, then charge up your army, aim for something weak with the Beastlord and kill it, pray for the double turn and get that command ability off to give +1 to hit, charge and run rolls. 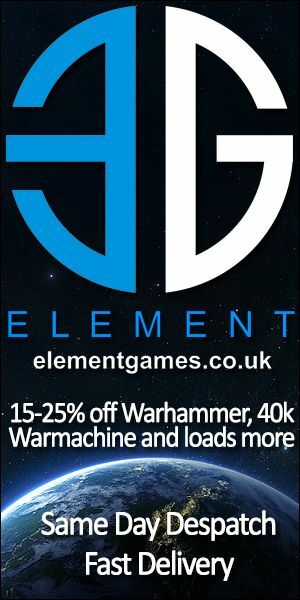 This will now mean the Beastlord is hitting on 2's and re-rolling 1's as well as anything in 16" buffing up too. He is also now a Hero killing machine with re-rolling wounds too! 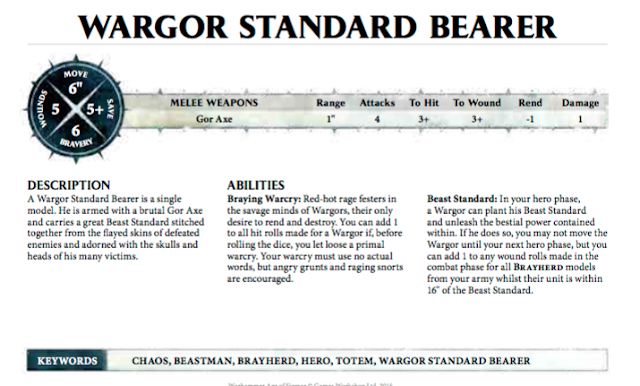 So another auto include for me is a Wargor. He has similar stats to the lord, but a few extra bonuses. Run him up and plant that banner, protect him with other units and the fun begins. If you let out a little primal roar then with the Beastlord command ability he is auto hitting. But it is his banner that makes him an auto. Keep him centre of your army and he will give all your bray herd +1 to wound. Going back to the Lord, he is now 2+ to hit, re-rolling 1's and 2+ to wound re-rolling 1's against hero's. There is two reasons this should be auto include, if not 2 or 3 of them. They have the ability to cast mystic shield, which with the Beastmen's lack of good armour saves is needed. They also allow you to move an extra 3 inches! In an ideal world you would take three, one centre, one left flank, one right. Giving your whole army more movement. But the most necessary would be centre with Lord and Wargor + Bodyguards to get them to combat quickly. The Savage Dominion spell is ok, but you will probably not want to waste your mystic shield. 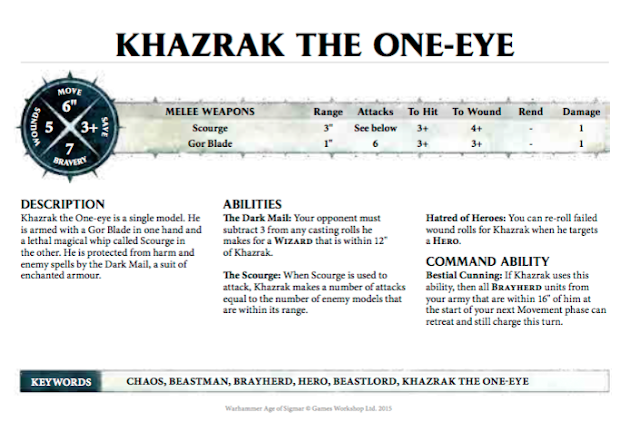 The other benefit is the fact they have keywords Chaos and Wizard, meaning you can summon pretty much anything from the Daemon army list. Now not an auto include but a great addition as a General if you have room and reason. He allows retreat and charge! So you can redirect all over the show. With the Brayshaman and musicians, they can literally get from one side of the board to the other in a retreat, charge. Used it once and loved it. Great fun choice. 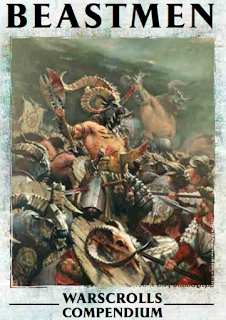 If you collect a Beastmen army, or are thinking of.. firstly, you are awesome! and secondly you will have and need plenty of these. The main bulk of the bray herd. Now, make sure there is at least 20 models per war scroll. 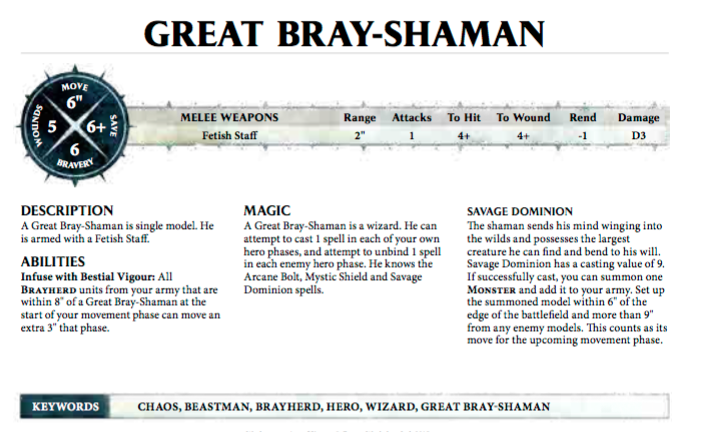 Make sure there is a musician and banner bearer and wielding 2 hand weapons, make sure they are within 8" of a BrayShaman and 16" of Lord and Wargor at all times and watch the magic happen. Next up with Lords +1 hit buff, they are now 3+ to hit re-rolling 1's and because there is 20 models or more, if you roll a 4+ before piling in, you have 2 attacks each with +2 to wound (+1 for planted wargor banner and +1 for Gor ability) so a 2+ Wound roll! Final Stat line - Move 9", Attack=2, 3+Hit(Re-roll 1's), 2+ Wound, 1 Damage. Can Run and Charge too. I use these as bodyguards for the heroes. Like the Gors, they have all the same move characteristics. But with the Buffs they become 2+ to Hit and 2+ to Wound. No more needs to be said. As if you haven't already got your Beastmen to be a wrecking ball, including this formation will mean everything has +1 Attack and will be re-rolling 1's to wound so also, an auto include. All the other units will be buffed also, but can be swapped around to suit your play style. 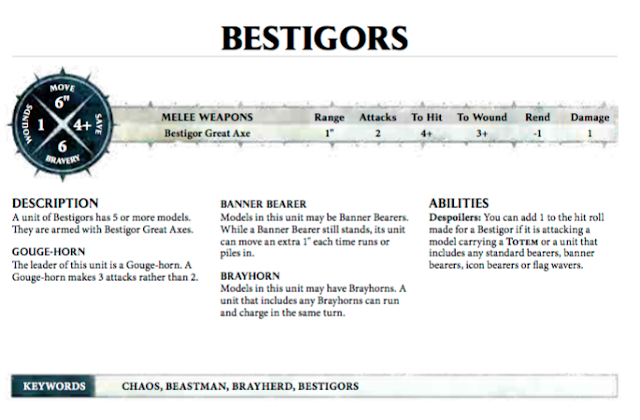 But as you can see, if you use Beastmen correctly, they become a massively hard hitting force, just keep your heroes safe. Sacrifice Ungors and Chariots and keep the rest close to them heroes. Opponents won't know how to deal with them and they should win often. 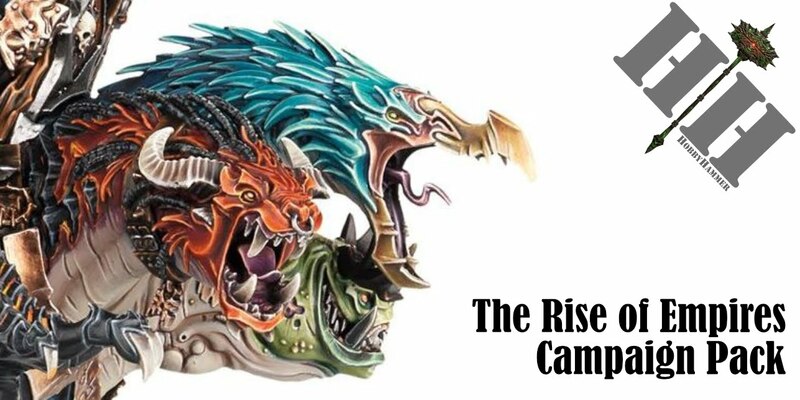 First look of Archaon Everchosen "Miniature"